It's weird to be back in a country where I know the language. After two weeks in Haiti I was getting used to puzzling over the signs, zoning out conversations that didn't concern me, and straining to catch French words here and there when I did care. French is the official language of Haiti, but I believe only 40% of the people can speak it. Everyone in Andre's family is well-educated so I could get by with my broken French. And of course I had Andre to translate. Today is my last day with Andre before I fly back to California tomorrow for a month. Yesterday we did last-minute souvenir shopping, visited friends, and played racquetball until the power went out at the courts. Andre will get coaching from brothers Alberto and Danelo while I'm gone. 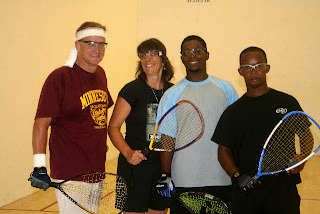 I told them that I expect him to get more than three points on me before late August or early September when I come back to DR.
On Saturday at the courts, we met an American named Joseph Kruchten who owns the only racquetball court on the north coast of DR. He and his Dominican girlfriend run a guesthouse and racquetball court outside of Puerto Plata (www.loase.com). They invited us to come stay there, but we'll have to do it next time since I'm leaving. Joseph, or Jose as they call him here, is a year older than I am and started playing racquetball in the late 1970s (I started in 1974), so we know a lot of the same old-timers in the game. It was fun to reminisce together. I don't know what our plan is for today. I'm still hoping I'll be able to see Margarita's grandson. He was born on 7-7-2007. Seems like an auspicious day. She's really sad that her son and daughter-in-law moved into their own apartment a few months ago. She can't get enough of her only grandchild. I'd like to take photos of the little guy. We're also going to get together with Nena, our police officer friend, whose baby is due in early Sept. I'll be asking friends in Santa Cruz for donations of used baby clothes, an umbrella stroller, a kangaroo pouch, etc. so I can bring them to her when I come back. We had talked about doing a baby shower, but Andre and I didn't stay in Santo Domingo very much this time, and Nena's best friend Antonia is working near Punta Cana several hours away, so she couldn't have participated. Besides, I don't think Nena's friends have any more money than she does. Babies, babies, babies. Seeing mothers with their daughters still makes me cry. I do get excited whenever Andre and I talk about kids, even if it's way too soon for that subject. It sounds so conventional to me to raise a boy and a girl with a husband -- a real nuclear family. We've even discussed which language he would speak with the kids: Creole or French. On the one hand, Creole would be great because it's Andre's mother tongue, the one he speaks best, that he loves the most. Then the kids could speak with everyone when we go down to Haiti for vacations. But French is tempting because of its universal appeal. They could still communicate in Haiti, but also in France, Canada, other Caribbean islands, many African countries. So I don't know, but if you have an opinion, let me know. Even if it is way too early to decide. To my friends in Santa Cruz, I'll be seeing you soon. I miss all of you, the cool foggy mornings, being able to walk around at night. I just wish Andre could come back with me now instead of having to wait until Feb. or March of next year. Hopefully, this will be our last separation.